David regularly presents workshops at music festivals, in communities (including remote regional and indigenous communities), schools and even Western Australia's jails! Over the years he's worked on projects involving a wide range of musical styles - from the country/gospel and reggae of the Central Desert Aboriginal community of Mantamaru, to blues and hip hop in his songwriting workshops in maximum security prisons. 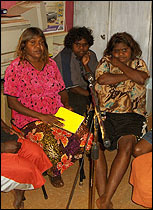 The prison workshops were the subject of a TV documentary on ABC's 'Stateline', with a compilation album of 12 songs - Songs from the Inside - released in May 2010. David is known for his ability to work easily with diverse and remote communities and in January 2010 was Artist in residence in the Cocos Islands, facilitating a youth music project in the Home Island Malay Community. Outlines of workshop options can be viewed in detail under the headings below. Workshops can be for groups as small as 4 and up to 25, ranging in times from 1 hour, to intense 3-4 day sessions, or weekly sessions for up to 6 weeks. As a songwriter David has written lyrics and music for numerous songs and been involved in collaborations with many fine Australian writers. He wrote the title song for the Australian feature film "Mad Bomber in Love" and his work has been heard on numerous TV soundtracks. He has also been 3 times nominated for the WAM "Song of the year" awards, receiving his first award in 1993 and more recently was a finalist in the national MusicOz awards (2006-7) and the Australian Songwriters Association Awards (2008). David Hyams has been playing Celtic Music for many years in bands and backing traditional tunes at sessions all over the planet. He has played and toured with some of Ireland's finest, including the Sean Keane band in 2005. He incorporates his knowledge of many styles, from country blues to jazz into his backing, resulting in a unique and innovative approach. In this workshop David, along with members of the Miles to Go band (or trio), will show you some approaches to backing celtic dance music on guitar that will enhance and support the flow and rhythm of the tunes. Aimed at those doing a first recording, trying to make a career in the industry, or simply curious to know what it is that a music producer actually does. A well produced recording can make a huge difference when it comes to being considered for festivals, getting radio airplay and/or recognition from the industry, as well as adding to your income through sales. The methodology you use will have great impact on final product. A non technical look at the role of the producer in recording and a 'how to' for self - produced artists to be able to take more control of the process. Presented by experienced producer in the folk/roots scene, David Hyams, who has produced 16 albums, among them classics such as Bernard Carney's 'Feathers and Tributes', as well as his own, Miles To Go band albums.